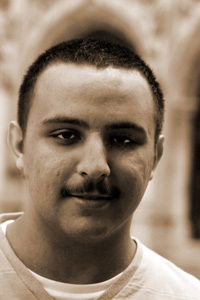 Mohammad Almoghrabi holds a BA in Arabic literature from the Faculty of Arts, University of Kuwait. He has served as editor of both the cultural section of the newspaper Arab Times and of the National Council for Culture, Arts, and Letters’ Journal of the Arts. His publications include the poetry collections Obi and in Your Face and Go to Bed (2004) and On Recent Thresholds (2001), the long poems Outside of the Biography of Death (2005) and Is the Rain (2007), and the novel Leg Throne (2007). He is a member of the Association of Writers in Kuwait and is a regular participant in poetry festivals in Kuwait and throughout the Arabian Gulf.